Description: Adrenergic blocker, it causes a stimulation of adenylate cyclase, protein kinases and degradation of triglycerides into free fatty acids and glycerol, increasing lipolysis. 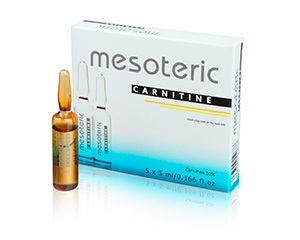 Description: L-carnitine is an amino acid involved in the metabolism of fatty acids. It is a physiological “carrier” transporting fatty acids to the mitochondria, where oxidation and subsequent energy release occur. It is indicated in the treatment of hydrolipodystrophy for its ability to metabolize fat facilitating metabolism resulting in increased lipolysis by increased cAMP. Description: Venotonic solution which acts as an adjunct in the treatment of lipodystrophy that helps to eliminate free fatty acids and glycerol. Enhances lymph draining and activates return venous flow. By reducing capillary permeability, it reduces oedema and the feeling of swelling. It also improves striae microflow and reducing fluid retention. Indications: localized cellulite, veno-lymphatic insufficiency, lymphatic stasis, striae. 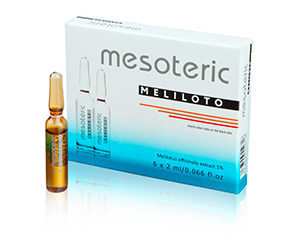 Active Ingredients: Melilotus officinalis extract 1%. Description: Organic silicon stabilizes the dermal matrix structure by stimulating fibroblast metabolism and helping right arrangement of collagen and elastin fibers. Prevents skin aging and improves regeneration processes. Also takes part in lipolysis. Indications: Chronological aging, stressed skin, skin flaccidness and decreased tonus, localized adiposity, hydrolipodystrophy. 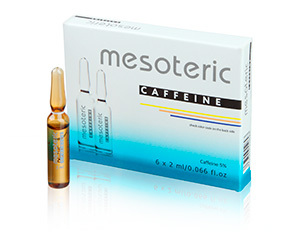 Active Ingredients: Methylsilanol Mannuronate 1%. Description: As a power antioxidant, this solution increases strength and elasticity of the skin, makes it tighter and young looking. Decreasing signs of aging. Neutralizes free radicals and enhances vitamin E antioxidant activity. Stops oxidative stress and prevents postinflammatory hyperpigmentation. Indications: low elasticity, striae, aging signs, hyperpigmentation. Active Ingredients: Ascorbic Acid 5%.